Trees Are Social and Communicate - M.L. Collins- Author of Out the Door! In this snippet from Out the Door! our heroine Aida learns that trees communicate with each other and that there’s something called the “wood wide web”! Well, it seems that trees do indeed have a social life! From both North America and Europe, there is some astounding research emerging — research that may make you change the way you think about a forest forever. Trees not only “talk” to each other, but do so often, and over large distances! His research has been corroborated elsewhere. Suzanne Simard, a professor of forest ecology at the University of British Columbia, has examined feedback and communication between plant and soil communities, and has tested theories about how trees communicate with other trees. She used radioactive carbon to measure the flow and sharing of carbon between individual trees and species. Simard has helped identify “mother trees” — large trees that act as central hubs for a vast-below ground network. 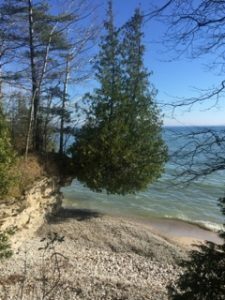 So the next time you hike in Peninsula State Park, think about the interconnected universe beneath your feet — and that tree “intelligence” is now being recognized by scientists. « Corsica Loaf Is an Aphrodisiac!